Earlier this year, obesity rated as the biggest health problem for children in the C.S. Mott Children’s Hospital National Poll on Children’s Health. In this Poll, we examined the connection between parents’ weight and their children’s weight, as well as health concerns, discussion of health behaviors related to obesity, and limits that parents set for behaviors at home that could influence children’s body weight. Weights and heights were self-reported for adults; parents reported about their children. For many families, obesity is a two-generation phenomenon. Results of this poll indicate that 39% of families with children age 6-13 have at least one child overweight (23%) or obese (16%). Children who are obese or overweight were almost twice as likely to have an obese parent than healthy weight children, 52% of families with obese children and 49% of families with overweight children had an obese parent, compared with only 26% of families with all healthy weight children having an obese parent. For parents with overweight or obese children age 6-13, bullying is rated at the top of a list of twenty concerns for children in their communities. 36% of parents of overweight or obese children rate bullying as a big health problem compared with only 22% of parents with healthy weight children. Parents of overweight or obese children were also more likely to rate neighborhood safety and not enough opportunities for physical activity as big health problems for children (Figure 1). Most parents of overweight or obese children age 6-13 say that they have “a lot” of discussion about limiting junk food (69%), neighborhood safety (75%), and getting regular physical activity (68%). Nearly all parents also report setting limits on junk food, but 30% of parents do not set limits on TV, videos or computer games for their overweight or obese children. 39% of families with children age 6-13 have one or more overweight or obese children. Bullying is rated as the top health concern for children by parents of children age 6-13 who are either overweight or obese. 30% of parents with overweight or obese children age 6-13 do not set limits on TV, video or computer games. 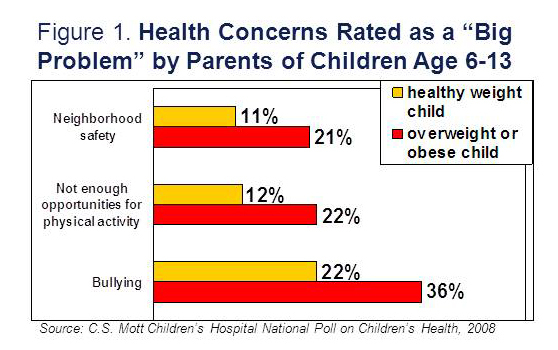 A new finding from this Poll is that parents of overweight and obese children are so much more likely than parents of healthy weight children to rate bullying as a major health problem. This may indicate bullying that has victimized their own children, or may indicate a broader level of concern about the problem of bullying, which is known to be a problem for children with increased weight. Bullying prevention programs will need to be mindful of obesity as a potential trigger for bullying behavior. Bullying, neighborhood safety, a lack of opportunities for physical activity, and not having limits on TV, video or computer games may be significant barriers to addressing the childhood obesity epidemic. Davis MM, Singer DC, Butchart AT, Clark SJ. Bullying worries parents of overweight and obese children. C.S. Mott Children’s Hospital National Poll on Children’s Health, University of Michigan. Vol 4, Issue 4, September 2008. Available at: http://mottpoll.org/reports-surveys/bullying-worries-parents-overweight-and-obese-children.